As many have said, "Land of the Tiger" features many high fences. To be honest, though, it wasn't all too noticeable, as the Tiger Rock itself draws most of your attention. The area around the drop and main entrance to the area, is themed around a conservation site, with the wooden fences decorated as large supply crates. There's some nice theming around the enclosures near the drop (I didn't go too far down where Peeking Heights was), with some crates, shovels, binoculars, all that stuff. The bridge going over the flume itself has a new bridge running alongside it for the tigers (although, I personally didn't see any of the tigers on any of the bridges, one came close but walked off). The area where the Buddha is has all sorts of signs, about some festival, and also signs directing you to "Tiger Cave" "Tiger Pool" and of course, "Tiger Rock". The sign pointing to Tiger Rock is pointing to the theming feature, and not the ride, which could cause confusion. The panning for gold thing has been changed to a doughnuts and churros stand. Now, as you've probably seen, unfortunately, the dragon has been covered up and honestly, it looks awful in person, you can easily see where it was the dragon and some of the green paint remains. The ride entrance is pretty much the same, but painted up in a tiger pattern and with a new sign. Finally, the music is absolutely fantastic, really atmospheric and honestly makes the area. It doesn't sound like anything Chessington have done before. The queue in the station remains, there's some signs explaining the story, how you're in the "Tiger Temple", you're travelling down the "Amur River" and you're "Connecting with the Spirit of the Tiger". There's also a scene up on the wall, and a show sequence plays every so often with a tiger over your head. The ride is mostly the same until you get to the former Dragon tunnel. Inside, there's some strobes that flash on the water. There's a wall along the side with some faint faces and such in, that light up and change to tigers. You then go past a tiger head with mist coming out of it's mouth, as roaring sound effects play and some music starts. As you exit the tunnel, you catch your first glimpse of the tiger rock on the ride. You pass by the old Chan's Cycles and Lee's Laundry, which are now painted all red and completely bare which I think is a shame. There's some nice audio as you go up the lift and when you're on the top. As you go through the tiger head you're sprayed with mist, like Wicker Man, which means you get wetter than on Dragon Falls. The old photo kiosk is now a tiny gift shop selling mostly just generic tiger stuff, some Tiger Rock bears, cups and pin badges. The old food kiosk is now the photo kiosk. This review is getting long so I'll keep this short: Overall, I thought Tiger Rock and Land of the Tiger was alright. Not much has changed to be honest, and I was disappointed with some of the theming being removed. I am happy that the ride is back as I felt a part of Chessie was missing without Dragon Falls, without it it was just repeat rides on Fury, Vampire and Rattlesnake. I'm a bit late to the party on this one. Went to Chessington recently and can't say I'm particularly impressed with Tiger Rock. This however is based on the fact that I much prefer the zoo/animals being in a separate area of the park entirely, and the theme park being a completely different part. I'm not really a whole fan of this whole idea of integrating the zoo. I've never liked Busch Gardens for the same reason. The whole Land of the Tiger area lacks theming, and the ride areas just look bare and sparse. I LOVE the new soundtrack in the station however, although this would have worked perfectly with the old Dragon Falls. To me, it's still Dragon Falls, and always will be. The Tiger head over the final drop is far too big; a huge part of what everybody loved about Dragon Falls was the fantastic view for spectators. That has largely been ruined by the huge tiger's head covering the majority of the drop. I would much rather the tigers had been added to the zoo section of the park, the whole Mystic East area simply brightened up, given a new lease of life, and Dragon Falls remain as it was, with the fantastic addition of the new soundtrack. There are some new elements that I like, including the added lights/sounds in the tunnel. Although not executed particularly well, the thought of using the tunnel to create more of an impact is a good one. I just wish it had been thought about a bit more and executed a bit better. Overall, I love the soundtrack and the attempt at making the tunnel more exciting. Other than that, bring back Dragon Falls. The Tiger head over the final drop is far too big; a huge part of what everybody loved about Dragon Falls was the fantastic view for spectators. That has largely been ruined by the huge tiger's head covering the majority of the drop. Well it beats Tomb Blaster's shed tbh. Had the pleasure of seeing the Tiger Talk today. Was really interesting to see the tigers up close and how they train them - they use a whistle like thing on the end of a long stick, so the tiger has to follow the whistle and blow into it to get his or her food. A couple of times they made her stand up and my god, those things are much bigger than they look. They also spoke a bit about Wildfire at Kolmarden - they explained how the tigers wouldn't be bothered by the noise of the log flume, because they were situated by the main drop of the ride back in Sweden, so they're used to it by now. Tiger Rock is good, though I did prefer Dragon Falls in its prime. Some nice additions but a shame about the loss of the dragon theming, which was more impressive and detailed than anything there now IMO. Also, we didn't see a single tiger! 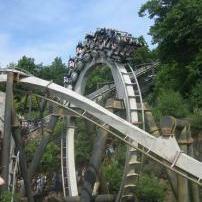 In good log flume news, Tiger Rock has been getting a system overhaul over the closed season. New operating panel, new operating systems. I'd say we should expect a later opening this year.. The last post in this thread before today was August. I think we have better things to do on January 1st than change the thread titles for new attractions. But, yes, you're right. It should be named differently, and I have done so. Thank you! you're right. It should be named differently, and I have done so. Thank you!